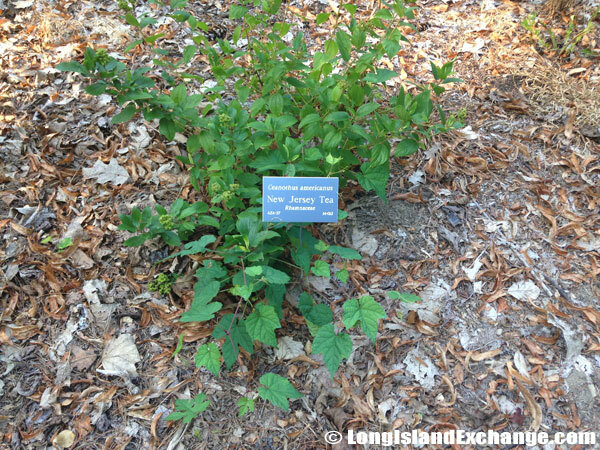 The Planting Fields Arboretum State Park lies between Oyster Bay, New York and Locust Valley, Long Island, New York. It is within the Planting Fields Road. Seasons/Hours: The park is open year-round 9 a.m.-5 p.m., except Christmas. Greenhouses close at 4 p.m. Admission: Memorial Day-Labor Day $8 per car, Sept.-May $8 per car on weekends and holidays only. Coe Hall is open daily, except holidays, for guided tours April 1 thru September 30 from noon to 3:30 p.m. Admission: $6.50 adults; $5.00 NYS seniors and students with I.D. ; free for children (7-12). Self-Guided Tours: 12 and older: $3.50, Children (7-12): Free. A sign welcomes visitors to Planting Fields Arboretum State Historic Park. A sign states to please respect the following rules of no alcohol, no pets, no biking, no open fires and no large picnics. The fee booth collects the $8 fee as you enter the grounds. A garden etiquette sign suggests that proper etiquette be followed inside the park such as no tree climbing, no ball playing, bikes, scooters or skateboards, no large picnics, no walking in flower beds, no parking on grass and no pets. A sign details events happening at the park as well as a map of the grounds and other information for visitors. Overview: Everyone can enjoy the former Gold Coast estate of the W.R. Coe family that has over 400 acres of rolling lawns, gardens, woodlands, and nature walks. The Camellia Greenhouse displays the largest collection of camellias in the northeast, and the Main Greenhouse has extensive collections of hibiscus, orchids, succulents, and seasonal displays. The Spiderleaf Japanese Maple tree. The former estate of the W.R. Coe family who donated the property yo New York State in 1956. A large tree in the back of the Coe House. One of many many many grass filled trails around the 400 acre grounds. A Pink Spires Crabapple Tree. Coe Hall is the Tudor Revival residence of the Coe family and is open for guided tours from April to September. Guests sample the formal lifestyle of the 1920s and see stunning craftsmanship and impressive collections of furnishings, paintings, stained glass, and decorative arts. In addition to the mansion, visitors will experience a wide variety of gardens, specimen plantings, and charming outbuildings that make Planting Fields truly unique. A small home shaped office south of the Coe house. Sprinkers watering the garden trails. A statue along a trail near the west parking lot. A small house in its original form, locked, allows a look into the past. The arboretum is a lifetime gift for people who enjoy nature and who wish to research all that goes on in the physiology of plant phyla. Professional landscape artists program fresh planting, nurseries and cultivation so thoroughly that the grounds of the Park are a visual delight and heady experience almost throughout the year. The cavernous collection of both historic and conventional species is a taxonomist’s delight. The Park also offers a pleasant and desirable option for events normally held in tiresome and impersonal interiors. Events especially weddings and exhibitions of splendid flowers proceed with the enthusiasm of just-born butterflies, while classes for people eager to learn about the Plant Kingdom hum with practiced efficiency in the background. A small house, locked, gives a view into the past. One of hundreds of marked trees throughout the grounds. A small house by the fountains to the side of the Coe House. The fountains provide a place to sit or take pictures. A bench sits near the fountains waiting for its next user. History: The name “Planting Fields” originally came from the Matinecock Indians who cultivated the rich soil in the clearings high above Long Island Sound. 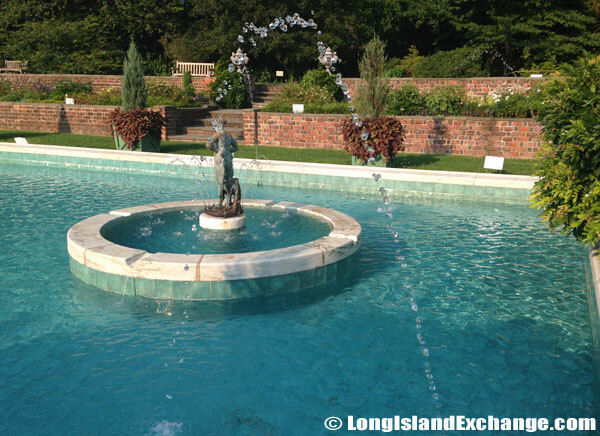 The present-day property on the popular Gold Coast of Long Island began between 1904 and 1912, when Helen MacGregor Byrne, wife of New York City lawyer James Byrne who’d bought six properties collectively referred to as “Upper Planting Fields Farm”. The large iron gates near the fountains. A corner view of the fountain area. Water shoots from the side of the fountain pool. 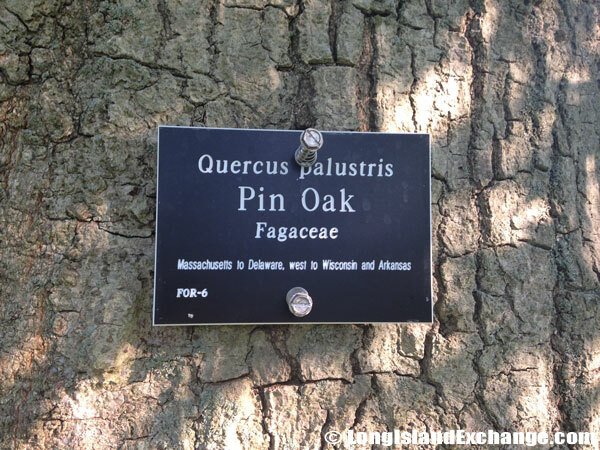 A Pin Oak tree, common in Massachusetts to Delaware. Also found west to Wisconsin and Arkansas. It was also once home of William Robertson Coe, insurance and railroad executive, and his wife Mary “Mai” Huttleston Coe, the youngest daughter of millionaire industrialist Henry H. Rogers, who had been a principal of Standard Oil. Two gigantic beeches, with root balls thirty feet in diameter, were ferried across Long Island Sound in mid-winter. Roads were widened and utility wires temporarily removed to make way. Only one of the two trees survived the journey. Unfortunately, the second beech tree has died, and was taken down in February 2006. However, the “Fairhaven Beech” will live on. Seedlings were collected from the tree from 2000-2005. Trails behind the fountains eventually lead to the main visitor center. 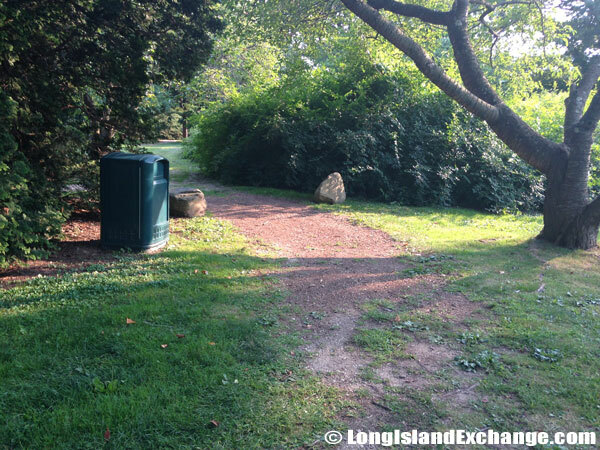 Yes more grassy trails around the 400 acre grounds. Facilities: 409 acres; 4.5 miles of nature trails and 150 acres of landscaped plantings, including rhododendron and azalea displays. There’s also a synoptic garden, a rose garden, a main greenhouse with exotic plants year-round, a camellia greenhouse and a gift shop (with plant sales). Hay Barn at the Visitor Center. The visitor center and gift shop as well as the L.I. Regional Archives is a partnership between the New York State Parks, Planting Fields Foundation and the Hoffman Foundation. The Library on the east side of the visitors center. The back door of the Long Island Regional Archives. A map of the grounds at the Planting Fields Arboretum State Historic Park, a Gold Coast Historical Estate listed on the National Register of Historic Places. A sign describing the park and its history as you enter or leave the grounds. Leaving the grounds a sign suggests to stop and allow the gates to open automatically when closed. Pets: No Pets Are Allowed.